Staffers at Consumers Credit Union identify members who might be likely to leave a positive review online. The credit union sends a few dozen email solicitations every month, and a handful of positive reviews have resulted. Consumers Credit Union ($1.2B, Gurnee, IL) is polishing up its online image by incenting employees to identify members who might post a positive online review. The Illinois credit union’s 5 Star Difference program calls for staff who have a particularly good interaction with a member to send that info via intranet form to digital marketing manager Eric Shriey. He then emails the members to ask them to post feedback on review sites such as Yelp, Google, Credit Karma, Wallet Hub, and Deposit Accounts. Shriey says two realities drove the creation of this program. 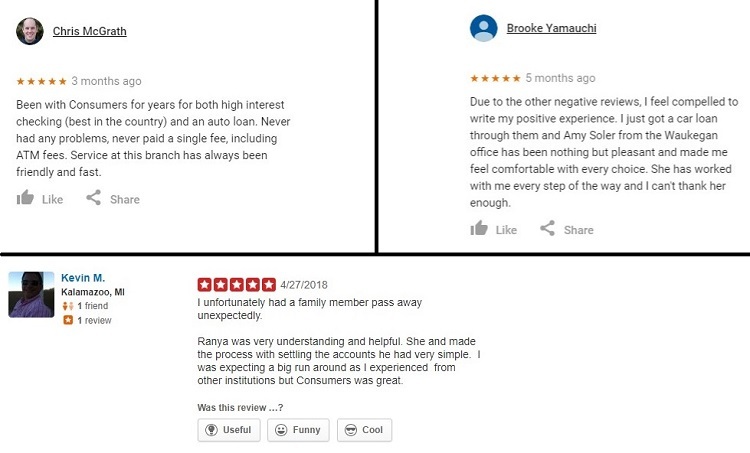 First, that online reviews play a crucial role in a credit union’s reputation, and, second, that most reviews tend to be negative. Shriey says he receives 25 to 40 submissions a month and a couple of members respond each month with a positive review. He’d like to see more responses and is looking for more submissions from his colleagues to make that happen. Review site terms of service typically forbid offering incentives to consumers to post positive reviews. So, CCU incents its staff instead. Personal and professional service are highlighted by members who posted positive reviews after they received 5 Star Difference emails. The 5 Star Difference program is completely voluntary, and all CCU employees are eligible. Those who submit at least two forms a month are placed in a drawing to win one of five $20 gift cards. Whether a member ultimately leaves a review doesn’t matter. It’s the submissions that do. Consumers Credit Union has a distinct logo to internally promote the 5 Star Difference program. “It’s a nice, non-salesy way to engage with members, by sending them an email and asking for a favor,” Shriey says. Tactics for increasing submissions and subsequently more good reviews going forward, Shriey says, might include larger incentives, more staff communication, and team competitions. But it won’t include more emails to members. “We don’t want to get pushy with them,” the digital marketing manager says. CCU staff uses a standard form to submit names for the credit union's 5-Star Difference program. Members identified by staff as potential promoters receive an email encouraging them to post a positive review. Download the 5-Star Form and the Email Template. In addition to sending the emails, Shriey keeps up with the rules at multiple review sites and checked in with his Yelp account representative before launching the program in January. Shriey also vets each submission, checking to ensure it was a positive interaction with a member, not an attorney or someone else with power of attorney. “I read them all but I don’t blindly accept them all,” he says. Once he’s satisfied it’s a good submission, he selects a review site to specifically link to in the email’s call to action. He primarily sends member respondents to Yelp or Google but occasionally sends them to Credit Karma and Lending Tree’s DepositAccounts.com. Shriey says the 5 Star Difference program took two to three months from concept to launch. The program name was a team effort, and he created the logo, email template, and submission form. All in all, the program is a reasonable lift for the reward. “The biggest legwork is checking out the submissions and then moving them to the email program to kick out to the member,” Shriey says. The credit union has 11 branches, including at its headquarters, so that means 22 review pages to keep up with on Google and Yelp alone. And, CCU also maintains a Facebook page. The 5 Star Difference program also encourages employee engagement while fitting neatly into CCU’s overall member engagement strategy, says Jennifer Fournier, the credit union’s chief marketing officer. Respond to reviews and monitor social media accounts, search rankings, online listings, and more all through one easy-to-use tool. Find out how CUBrandMonitor from Callahan & Associates helps credit unions take charge of their online reputation.